The (Margot & Todd) “Dinette” is now the “Ruddy Library, what, eh?” #narrowboat #pretentiousness #moi – The Diesel-Electric Elephant Company. What was a four-seater eating area and a two-person bed is fast becoming a two-person eating area, a redesigned solid-as-a-rock desk, a single bed… with all of the storage it had before PLUS a 75″ x 15″ locker (lined out in carpet) AND a 75″ x 15″ bookshelf with four extra 230v sockets, two USB charging sockets and two 12v sockets. There’s even space underneath for my vast heap of shoes and walking boots to be slung out of sight. If in the nineteen-seventies it was acceptable for Margot and Todd to call the original a “dinette” then I am damned sure that in the twenty-teens or whatever we’re currently in it is acceptable for me to refer to the space from now on as “The Library”! Alright, the boat’s far too young to have known what a “dinette” was, but give it a day or two and there’ll be 75″ of luvverly books lined up on that shelf. These little 12v beasties (just like car accessory sockets) will allow me to run the laptop and similar stuff without needing the inverter to be on – two ampere-ish things an hour saved there that my solar panels can better direct elsewhere. The table is an entirely new lump of oak-faced ply, varnished by yours truly (out in the mid-day sun – tee-hee, boing, boing, wibble moo fribble de-clomp I think it’s sunstroke, m’lud…) and it will soon be stood standing on a new leg and with new bracing structures so that, unlike the old table, this one stays upright and doesn’t collapse under the weight of a small but lovingly prepared bucket of gin and tonic. 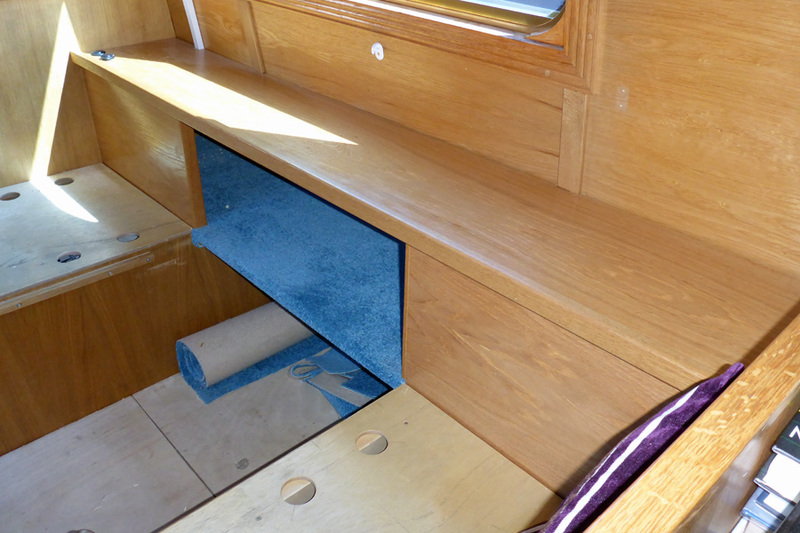 The old table will be going on to do service in the engine bay, as backing for some more panels of soundproofing. Waste not, etcetera, etcetera. In other news, the Bro did some extremely brave things with the Cardinal’s engine yesterday, including adjusting something called “the tappets”. I gave him (non-alcoholic) drinks, fetched any tools called for and tried to leave him to it so as not to break his concentration. Henceforth he shall officially be known as ‘Gunga Din’. Both alternators have been tickled and prodded and suchlike and now treat the warning light on the instrument panel with the proper respect, and they both charge away like healthy charging things, one to the starter battery, one to the domestic batteries. The (very small, semi-trad) rear deck is now painted and ready for new rubber mat to go down, the well deck will follow suit asap or sooner while this dry spell lasts. A million (possibly two million) other small jobs have been done, and I am ready for my bed. Oh sheesh, am I ever ready for my bed. I love my bed. If arranging oneself horizontally and sleeping the sleep that only those with a 120db “pig and whistle” snore can truly know were an Olympic event, then I’d be bringing home a swag-bag full of gold medals for England about now. Sitting down and doing sod-all. Why isn’t that an Olympic event? It’s just as difficult to do really properly as is runnin’ or jumpin’ or throwin’ things. I shall start a petition to see which of the more accessible, everyday sports we can get included in the next Olympic games. Re-wiring, re-plumbing and re-woodworking a narrowboat for one, that should be an Olympic event. We are, now, gently sliding on our raggedy arses down the “almost there” side of the moutainous list of jobs. The end (of the beginning) beckons. Wheeeeee! Cutting down the cushions to fit the new reduced seating and bed space also beckons. I love your posts. Such a great mixture of serious subjects and humorous delivery. Giggleworthy. Just remember, the process of getting there is as important and the before and after pics… I’ve never seen a boat with cleaner bilges. Cardinale is looking beautiful. I wish I knew what half the things that you mention actually are! Good luck on your slide down to the end. You make me feel tired just reading about the things you are doing to the Cardinale; can’t wait for the ultimate ‘before’ and ‘after’ pics! What dedication, what flare, what an amazing bro you have! !